The teenage boy described by outreach worker Antonio Carlos da Silva could be any of Brazil’s football-mad youngsters. “He was hoping to turn professional, so that he could help his mother get treatment for her drug addiction and buy her a house,” Mr Silva recalls. 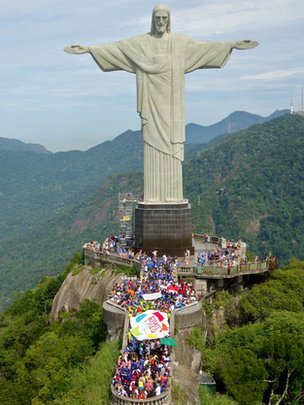 The tournament currently under way in Rio is the second such event to be held uniting teams of street children from 19 countries, four years after the inaugural competition in Durban. 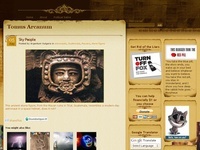 Bernardo Rosemeyer is the founder of O Pequeno Nazareno, a non-governmental organisation which runs the shelter into which Rodrigo moved aged nine. He says the prospect of competing in the Street Child World Cup instilled discipline in Rodrigo’s life. But what happened to Team Brazil’s best striker shortly before he was due to take part in the Cup reflects the bitter reality of children at the bottom of Brazil’s society. “I told the players about his death when we all met up to take the bus to the training session,” recalls Mr Silva. At Rodrigo’s funeral, it was his team mates who carried his coffin. 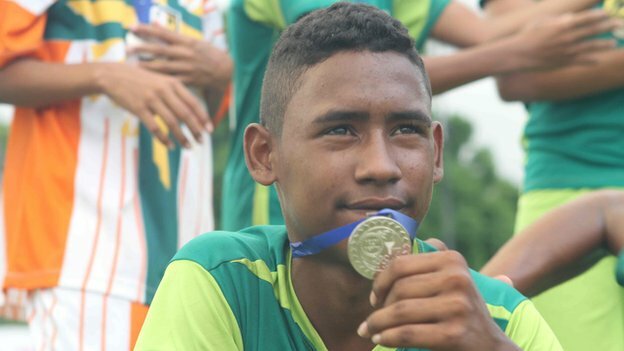 Goalkeeper Pedro Levi, a 15-year-old who also lived on the streets of Fortaleza before moving into a shelter, says Rodrigo has left a gaping hole in the team: “He was a great player. The best thing about him was his leadership, he would bring the whole team together. Pedro says the team is determined to bring the trophy home “for Rodrigo”. 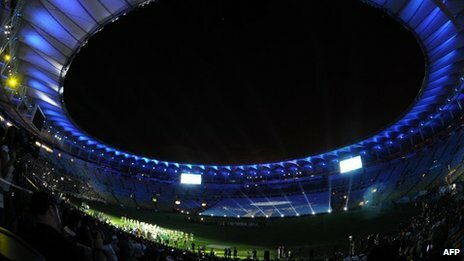 Before their first match against Egypt, the players observed a minute’s silence in Rodrigo’s honour. 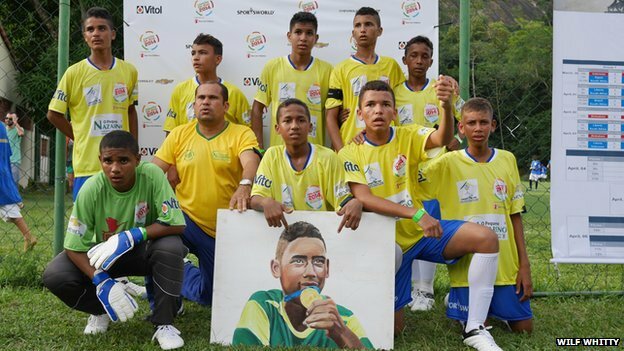 Team mate Diego Rocha, 14, held a portrait of Rodrigo as Rio’s Archbishop, Dom Orani Tempesta, and a former captain of Brazil’s national team, Gilberto Silva, watched. Rodrigo’s team went on to beat Egypt 4-0. But their victory felt bittersweet. “We dedicate this match to the memory of Rodrigo,” Diego said. The team is determined that Rodrigo will not be forgotten and plan to keep displaying his portrait as they progress through the tournament to Sunday’s final. But the reality for Brazil’s 23,000 street children is anything but rosy. Gang and drug violence remain endemic in poor communities. 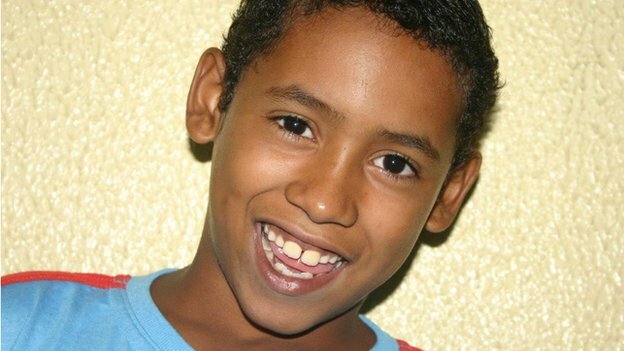 In Rodrigo’s home state of Ceara alone, there were 4,462 murders in 2013. Murders of street children routinely go unpunished and there has been no investigation into Rodrigo’s death. 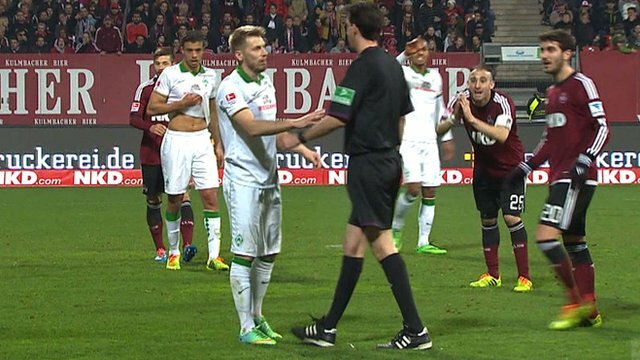 Werder Bremen captain Aaron Hunt denied his own team a penalty against German rivals Nuremberg – by admitting to the referee that he had not been fouled. Hunt tumbled under a challenge from home defender Javier Pinola as Werder led 2-0 in Saturday’s Bundesliga clash. Referee Manuel Graefe pointed to the spot before the midfielder asked him to reverse the 75th-minute decision. “Out of instinct, I wanted to provoke the penalty, but that was wrong,” Hunt, 27, told German media afterwards. Graefe awarded a drop-ball instead before 11th-placed Werder, who are now eight points above the relegation zone, saw out the 2-0 win. “I struggled with myself a bit (to say something), but we don’t want to win any games like that, even if we are in a relegation battle,” added Germany international Hunt, who has an English mother. His actions also drew praise from Argentine left-back Pinola. “I take my hat off to him,” he said. Yes, a little flag, uma bandeirinha. How many countries have a bird that displays the colours of their national flag? Brazil has one, yes, the bandeirinha, Chlorophonia cyanea. You can see a wonderful collection of Brazilian bird photos here. They were taken at Itatiaia National Park in the highlands of Rio de Janeiro state, and all on the same day. Brazil also has another species of Bandeirinha, the new phenomenon of girl linesmen at football matches. Their male counterparts are still called árbitros. The use of the diminutive ‘little flags’ for the girls is a form of endearment, as you can see they deserve it.